This filter is for “whole house” use for the removal of sediment only. With a sediment cartridge, it can be used for service flows of up to 10 gallons per minute. It it not for use with carbon filters, except in very low-flow situations — 1.5 gpm or less. As a sediment filter, it can handle service flows in the 10 gpm range. The unit comes with mounting bracket, screws, a filter wrench, and a 5-micron pleated (FloMax), washable and reusable cartridge. Any standard sized (2.5" X 9.75") sediment cartridge can be used as a replacement. With the 5 micron cartridge provided, the pressure drop is slightly more than 1/2 psi at 10 gallons per minute. 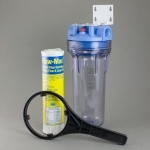 Pure Water Products light duty clear sediment filter has 3/4" ports. This is an excellent unit for light sediment whole house use and for prefiltering for other treatment devices like softeners, upflow filters, and ultraviolet purifiers. The filter is light enough that in most cases it can be supported by the pipe and does not require use of the mounting bracket. The unit has a pressure release button and can be mounted for either right-to-left or left-to-right service. 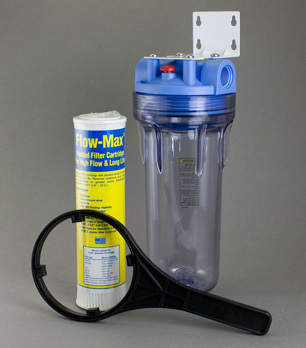 Includes 5 micron pleated sediment cartridge, bracket, screws and wrench.